I’m proud to be one of the mentors in the C-10 Mentoring & Leadership program through Royals General Manager Dayton Moore’s “C” You In The Major Leagues Foundation. C-10 is a life-changing program for high school students. Through the weekly program with C-10, we’re helping the students develop life skills, job skills, work on ACT prep, and tackle a monthly service project. 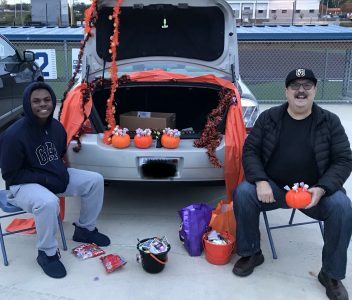 (The photo is from our October service project — a night of Trunk or Treating for elementary school students near the Urban Youth Academy.) All of these things are helping them become better servant leaders today and for the future. My mentee, Darryl, is a student with some big dreams. He’s a multi-sport athlete who wants to play in the Major Leagues one day. All 10 students in the program have great dreams. Dayton Moore and the foundation have big dreams of their own when it comes to C-10. Will you help us reach our goal?